A great friend and supporter of the Reds Heritage Society, Gil Mayer was enshrined into the AHL Hall of Fame in 2007. Gil was nicknamed “The Needle” because his 5-foot-6, 135-pound frame made him just about the smallest player in the league during his era. He made up for his diminutive stature with quickness and agility, and would be credited with winning 346 games over 14 AHL seasons from 1949-63, playing on four Calder Cup champions. Mayer posted 30 wins in a season seven different times, including a memorable 46-19-3 campaign in 1951-52. He led the Pittsburgh Hornets to Calder Cup championships in the 1952 and 1954 seasons. Along the way, he saw nine games in the NHL with the Toronto Maple Leafs. When the Hornets folded following the 1955-56 season, Mayer moved on to Hershey. He spent three seasons with the Bears, playing on teams that went on to win the Calder Cup in 1958 and 1959. He played the final two seasons of his brilliant career with the Reds. 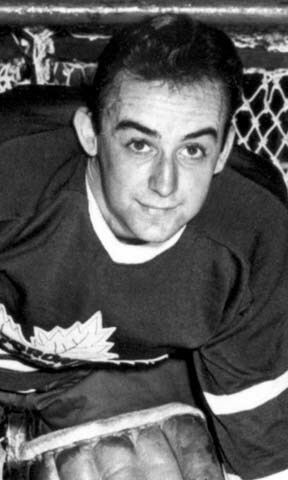 Five times in a six-year span, beginning in 1950-51 at the age of 20, Mayer captured the Harry “Hap” Holmes Award as the leagues goals-against leader and made 5 All-Star teams. He trails only Johnny Bower in all-time AHL wins and shutouts (41).